DRG Records S2L 5196. 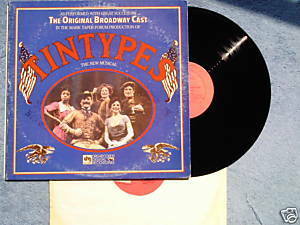 1981 Tintypes, Original Broadway Cast directed by Gary Pearle with Mel Marvin, Carolyn Mignini, Lynn Thigpen, Trey Wilson, Mary Catherine Wright. Set before World War I, Tinytypes is a veritable lesson in US history including characters of William Jennings Bryan, Emma Goldman, Henry Ford, and Anna Held. Two record set. Vinyl is VG; gatefold cover with photos is VG with some ringwear.